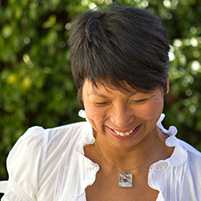 Vina Lustado is the founder/owner of Sol Haus Design, a design firm specializing in sustainable building in Ojai, California. In December 2012, Vina manifested her dream home in 140 square feet, a self-sufficient dwelling loaded with functionality, style and charm. Since then Vina’s home has captured the imagination of the tiny house enthusiasts from all over the world and has appeared in countless media publications.